One of a set of sixteen with XF21, XF22, XF23, XF199-XF203 and XF205-XF210. With turned baluster top rails and cross-bars, caned back panels and seats and sabre legs inset with shaped ebonised panels; paterae on the corners of the seat rails and at the tops of the curved back uprights. 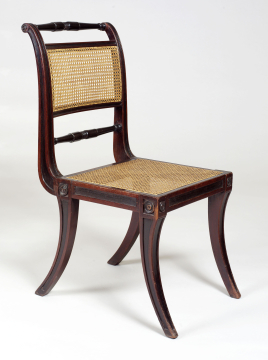 Chairs from this stylish set are shown in Soane’s first floor drawing rooms in a view of 1834, by C. J. Richardson (Vol. 52, 10), with their original blue squab cushions, described in the Furniture and Fittings inventory as ‘hair cushions covered with chintz furniture’.1 Twelve of the chairs stood in the South Drawing Room and four in the back or North Drawing Room at the time of Soane’s death.2 The paterae on the seat rails are very similar to those on the Grecian couch XF1. The squab cushions played an important role in the final decorative scheme for Soane’s drawing rooms with their blue colouring picking up the blue in the Brussels carpets laid in the mid-1830s shown in C. J. Richardson’s watercolour of 1834-1835 (Vol. 52, 10). 1 None of the original cushions survive. SM Archive, Inspectress’s Report on Furniture, May 1955, p. 2, notes ‘The Drawing room chairs, which, being in use by the public, have rather more wear and tear than the rest of the Museum furniture, have been thoroughly overhauled and where necessary repaired or re-caned. For these the Inspectress has made new squab seats with a stiffening square of plywood in each, in the hope of lessening the strain on the caning’. These post-war cushions too have disappeared. 2 The sixteen chairs shown on the first floor plan of No. 12, 1792, SM 32/2A/5, cannot be this set as the seat fronts are shaped.